"Ed Sheeran @ Wembley 10" by flamesworddragon is licensed under CC BY-SA - cropped, play button added. A music video storyboard is a detailed breakdown of your music video, containing the sequence of shots to film in chronological order. In this guide, we cover exactly how to create a storyboard for your video, why you should create one; and, additionally, we provide a detailed breakdown of a popular music video. Once you have decided on a concept for your music video, a music video storyboard should be the next thing on your list. It is typically comprised of a sketch of each shot, a rough estimate of its duration, and notes on what is happening. Music videos for fast-paced songs commonly have rapid frame changes and a fast-moving camera, while music videos for a slower pace song often have fewer frame changes and and a slower moving camera. The best way to establish the right pace is to analyse the tempo of your song. If it’s a ballad, then you’ll probably want a slower pace – if it’s pop, a music video with higher energy may work better. Decide on the pace of your video as early as possible to keep the style consistent. Before you begin planning the shots in your music video, it is essential that you are clear on the story you want to tell. Write a brief summary before starting your storyboard. This doesn’t need to be longer than a paragraph or two, simply explaining the sequence of events. Even if you have some filming experience, creating a storyboard from scratch is hard work and can be paralysing, especially when you’re not sure about the stylistic techniques you need. Before picking up a pencil to sketch out your storyboard, research existing music videos by artists that have a similar music style. Watch the first 20 seconds of a selected music video, and break this section down into a sequence of shots. Reflect on how the use of location and type of shots used impact the mood and pace of the video. Ed Sheeran’s Galway Girl, an upbeat folk song whose accompanying video combines a live performance with a romantic night out in Galway, Ireland. A simple concept, but with over 370 million views on YouTube, it encapsulates the heart of the song with its sequence of shots. It starts with a slow pan and the faint sound of screaming crowds. As soon as Sheeran starts singing, the camera switches to the crowd of fans. At 4 seconds, we have a shot of Sheeran waving an Irish flag, followed by a shot of him taking a picture of the crowd. These two symbols (the flag and the picture) help punctuate his song with the main theme – a nostalgic look back at his experience in Galway, Ireland. The camera swoops over [and seemingly through] his head and suddenly we see the world through his eyes. As a viewer, we‘re intrigued not only because it’s a unique way of filming, but also because we are – quite literally – pulled into his subjective experience. A shot of him walking through the backstage corridor rapidly accelerates (achieved through editing) adding more to the excitement. This continues until he ends up at the bar where the pace slows down — as he meets his love interest. Before their eyes have met, we know immediately who it is — as she is physically elevated over the cluster of people. 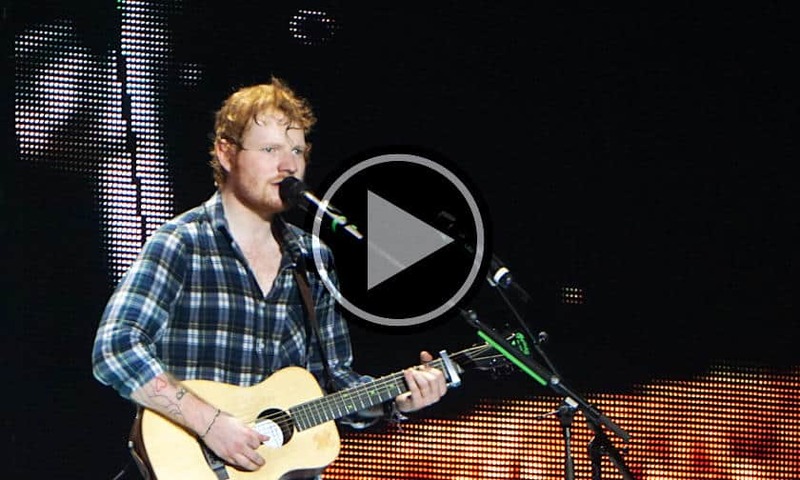 20 seconds: we see Sheeran’s hands write the words “Welcome to Galway” on a post-it note. Notice how he manages to put his finger on the pulse of the song’s meaning within just the first few seconds. The simple act of filming himself taking a photo or scribbling on a post-it note not only creates a nostalgic feeling, but also briefly interrupts the dynamic pace and allows for moments of reflection. It’s also worth noting that each frame lasts, on average, 2 seconds, so consider this when devising your own shot sequence. Focus on the first few seconds and make them as gripping as possible. You can’t expect your viewers to stick around for long if you don’t capture their attention early on. Think of a compelling and unexpected way to launch into your music video. Galway Girl starts with no music at all. In this case, the silence captivates with suspense which pulls the viewer in. A guiding rule, to keep in mind, is that you want every shot to have a level of tension — instead of giving everything away at once, aim to keep the viewer on the edge of their seat, wondering what will happen next. Now imagine if, instead, you begin the clip with a long shot of a crowded street with the faint sound of guitar strumming, coming from a blurry figure in the background. As the camera meanders through the crowd, we see a young woman standing still, watching the blurry figure in awe. She moves towards him and the camera follows her, until she is right in front of the young man performing, who is now in full focus. By creating this perspective and not immediately revealing where the music is coming from, you have successfully created tension and suspense – and therefore, retention of your viewer. Once you have decided the shots you want to use, start sketching these on your storyboard. The purpose of a storyboard is only to give you and your film crew an idea of what each shot entails, and it does not require you to have any high-level drawing skills, to save time use stick figures to compose the sketch and carrot noses that point in the desired direction! For displaying movement, use arrows. If, using the tricks above, you find sketching too difficult, try cutting out pictures from magazines, or using storyboard software like Storyboarder or Studiobinder. While the sketch will give the cameraperson an idea your desired shots, it’s equally important to use the notes section to fill in any gaps and bring more context to each shot, as well as a rough estimate of the duration. Try to include specific guidelines on how you envision the shot being filmed. Instructions like “the camera pulls into a close-up of her face”, or “slow pan over landscape” will tremendously help your videographer and ensure that you get the exact shot that you want. If you’re not sure about the technicalities, try to describe the mood or feeling you want this shot to capture. The more detail you can give, the better! While your gut instinct may be to just go out and film rather than sit and invest your time in sketching scenes, your music video storyboard will serve as a time saver in the long run. You’ll have a clearly laid out plan for yourself and your film crew on the day of filming, and won‘t have to face the frustrating situation of having to re-take any shots you had forgotten to make. Have you ever shot a music video? Did you storyboard your music video or do you have another technique? We would love to hear about your experiences in the comments below.